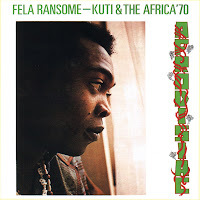 I've been listening to the first 9 re-releases of Fela's catalogue, which w ere released earlier this month, for a little while now. 9 records and if you've had the Fela Kuti experience, then you know you're in for some long groovy, jazzy, rhythmic jams. Needless to say, it took me a while to make my way through this part of the catalogue. But, these are must have records from the late Arfobeat legend. I've been listening with the intention of doing a review. Of course, when I set about doing that, I didn't take into consideration that once you start listening, you soon forget you're supposed to be thinking about writing a review. Somewhere along the line, during the first song, I found myself wiggling around to the dynamic rhythms. So, my "review" is bordering on non-existant! If you don't already own them, need to upgrade your collection (you know from the vinyl you lifted from your parents collection when you were a teen ... okay, maybe the rest of y'all didn't get sticky fingered with your parents stuff) or new to the Fela e xperience, pick them up. They're well worth the investment. I promise you, you'll have fun while listening and you'll understand why you're getting a borderline review. It's too hard to type and dance! You end up losing yourself in the music. Perhaps that's the best review there is, music so good you lose yourself in it. 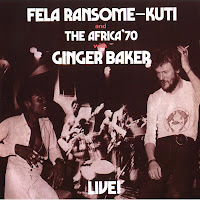 My personal faves are Fela Ransome-Kuti and The Africa'70 with Ginger Baker - Live! and the Open & Close / Afrodisiac releases. Be warned, if you listen at work as I do, you may find yourself dancing around he office and some offices frown upon that. Thankfully, mine isn't one of those offices. They give you the feeling of being there.